Wild: Like the Carnotaurus, Baryonyx Aquafulgur is on the smaller end of the tier of large predators. While not as powerful as some deep-sea predators or Spinosaurus, Baryonyx is an extremely fast swimmer who is still nimble enough to threaten most creatures on the island. Domesticated: Baryonyx’s natural affinity for aquatic predation means that once tamed, it learns to kill ocean dwellers even more efficiently. 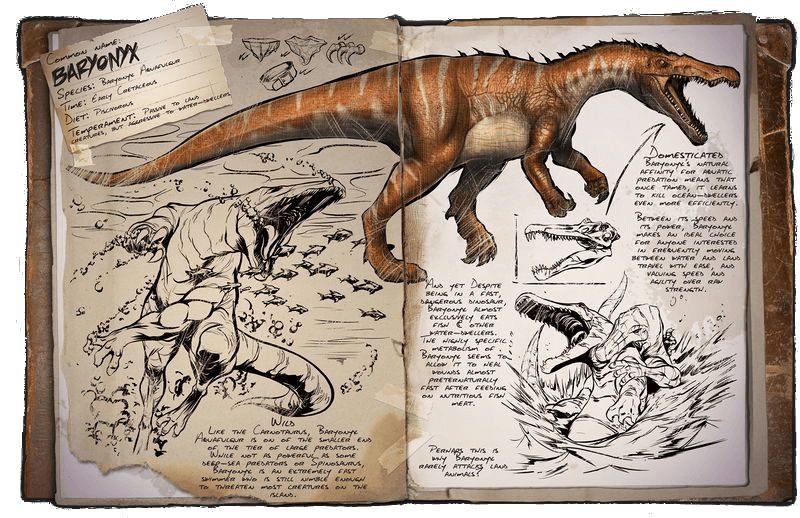 Between its speed and its power, Baryonyx makes an ideal choice for anyone interested in frequently moving between water and land travel with ease, and valuing speed and agility over raw strength. Known Information: And yet despite being a fast, dangerous dinosaur, Baryonyx almost exclusively eats fish and other water-dwellers. The highly specific metabolism of Baryonyx seems to allow it to heal wounds almost preternaturally fast after feeding on nutritious fish meat. Perhaps this is why Baryonyx rarely attacks land animals?